below the clouds on the Coromandel Peninsula. I mention the weather a lot I know, that's because it plays a huge role in our travels and determines what we do each day to a large degree. That said, the forecast is for heavy rain or showers for most of the country, particularly the North Island, for the next 4 days at least. We left our pretty but soaking wet beach-front campsite at Port Jackson and headed for the eastern side of the Coromandel. After the holiday destination of Whitianga, we passed what used to be quaint holiday bach (kiwi word for holiday home) territory for many kiwi families, but is now a coastline of some of the most expensive real estate in the region. The land continues to be sectioned up into small lots and sold off to become sterile holiday apartments (with very little charm). 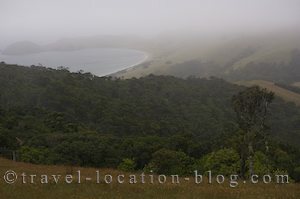 The coastline of the Coromandel is very scenic with large stretches of sandy beaches and native bush. The beaches are backdropped by the Coromandel Forest which has an extensive network of walking tracks passing by a variety of flora and fauna. Further towards the base of the peninsula, we pulled into the town of Waihi in the hope to find a place to park. Unfortunately the prices here were just as outrageous as the real estate industry - where you pay no less than $34 - $36 per night for two people for the privilege of parking on a piece of lawn with neighbouring campers only a couple of feet away on all sides (but apparently the facilities are very nice - even though we travel fully self contained). Last night we had a beautiful, remote campsite which was operated by the Department of Conservation, at a cost of $9.00 per person. The site had only basic facilities such as toilets (which suited us just fine), but the location was just magic!! It's amazing what a few kilometres can do. We ended up pulling in at the Uretara Domain in Katikati further along State Highway 2, where they allow up to 3 self contained camper-vans to park for free (for no more than 2 consecutive nights) we decided this was a great deal!! Don't get us wrong .. it's not that we mind to pay for camping but we do mind paying outrageous fees for parking on a small strip of lawn.